Valerie Gorospe grew up on Lane Road, seven miles from Delano, where just over two dozen houses sit feet away from what was once grape fields and are now almond fields.These houses share one thing in common: at least one person in each home suffers from some type of health issue. 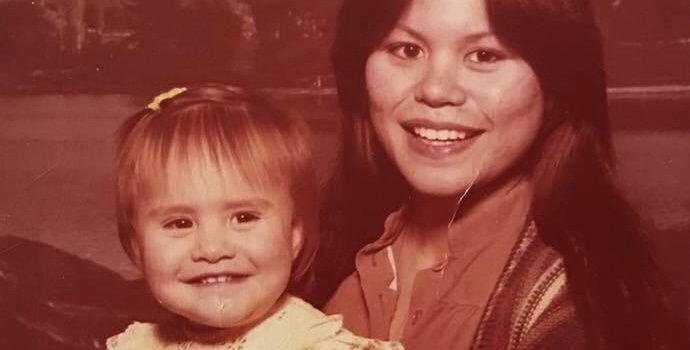 Although she’ll never know for sure, Gorospe wonders if the constant pesticide exposure has anything to do with her sister’s torturous migraines, her brother’s bloody noses and her mom’s deadly case of cancer. Despite not having hard evidence of the impacts exposure to pesticides have had on her neighbors in Earlimart, she has witnessed first hand the negative effects. She recalls November 1999, when her street was evacuated after pesticides drifted into her neighborhood. This wasn’t the first time, but it may have been the worst. The residents could smell it. They could see it. Officials took her neighbors to a nearby school, where they were put in a decontamination line, forced to strip with no privacy barriers and sprayed down by a fire hose. 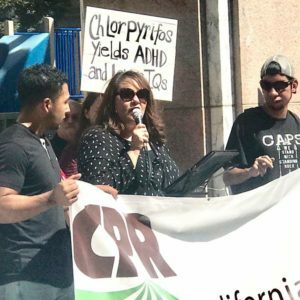 Because of the environmental injustices she witnessed outside her front door, Gorospe, 40, has fought and continues to fight for pesticide regulations. For nearly 10 years, she has worked for the Center on Race, Poverty and the Environment, which works to achieve environmental justice and healthy, sustainable communities through collective action and the law. However, it wasn’t just the incident that inspired her to fight for change. It was also her greatest role model — her mother. After the incident in 1999, Gorospe saw her mother, Teresa De Anda, take charge and advocate for a healthier community. 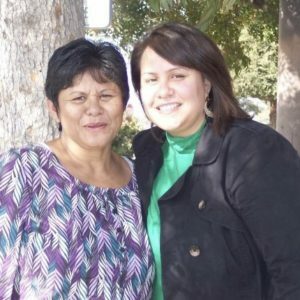 “When this accident happened, there was no questioning she was going to something about it,” Gorospe said of her mother. De Anda, a pesticide awareness advocate, was angry about the lack of regulations concerning pesticide use. She worked for the Californians for Pesticide Report and informed people in Earlimart, Weed Patch, Arvin and Lamont, towns where similar incidents took place. She built relationships with the Tulare and Kern agriculture commissioners and spoke with the board of supervisors and the city council. Growing up, Gorospe saw her mother fight for others and wanted to be just like her mother. She wanted to help people like De Anda did. “With girls, they want to be like their mom,” she said. Once Gorospe was old enough to get involved, she joined her mother, and together they worked as a team to fight for environmental justice. Gorospe began tagging along with her mom to important meetings. She took notes and learned how to become an effective changemaker. Because of their hard work and persistent advocacy, regulations were passed in 2008 that require farmers to have a quarter-mile buffer zone between schools and pesticide exposure. That was a victory for De Anda and Gorospe. “Our work and voices were not only heard, but honored in a way that resulted in meaningful, lasting change,” Gorospe said. A few years later, De Anda passed from liver cancer in 2014. It was up to Gorospe to continue the work her mother started. “I just really wanted to make sure her legacy was going to be honored and kept up,” Gorospe said. 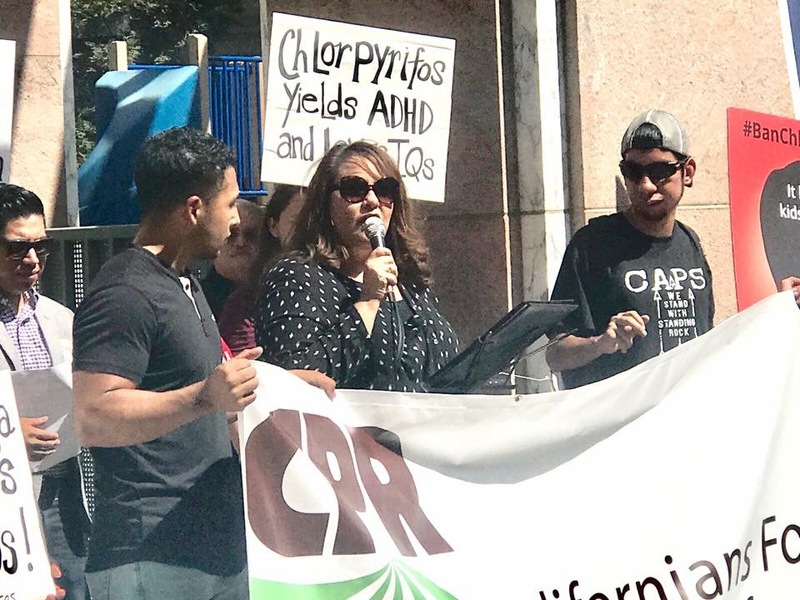 CRPE, along with other organizations, have started a pesticide campaign and are advocating for more regulations to not only protect schools, but also homes and parks. They’ve advocated for a one-mile buffer zone for quite some time, but aren’t hopeful. Gorospe, CRPE’s communications coordinator in the Delano office, does more than pesticide advocacy. She also works with the youth. Her most recent project with CRPE involved educating students on voting. 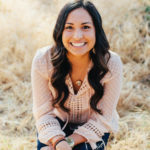 She worked with students in Delano to pass a resolution with the school district that allows students to hold voter registration events on campus. Valerie Gorospe advocating for environmental justice in her community. “These experiences — the discussions we had, being part of a policy change within their district — is something they will carry with them for their whole life,” she said. Gorospe hopes this experience will give the students the confidence to fight for injustices in the future.She believes in investing in the youth because they are the future. Gorospe calls herself the communications coordinator, but to students, she is a mentor. Students share personal stories with her, seeking advice. “Some never had a conversation with people about their parents being undocumented and their fears of not knowing if they are going to see their parents after school,” she said. Although CRPE focuses on environmental injustices, they strive to tackle other community issues directly related.